A damn delicious Gooey Cinnamon Roll Recipe makes a great holiday treat. Make the dough the night before, store in the refrigerator and bake the next morning. 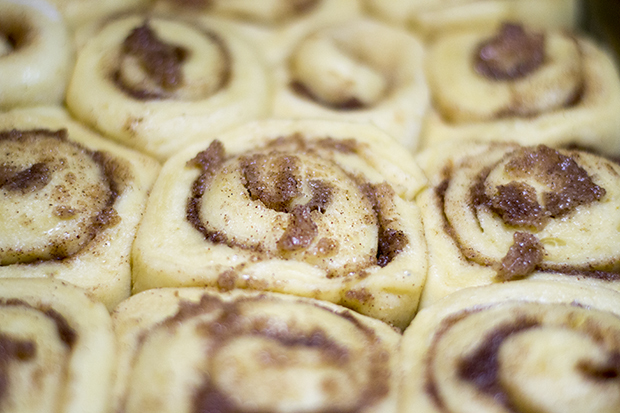 These homemade from scratch cinnamon rolls are easy, fresh, and delicious. Yep, you sure can. 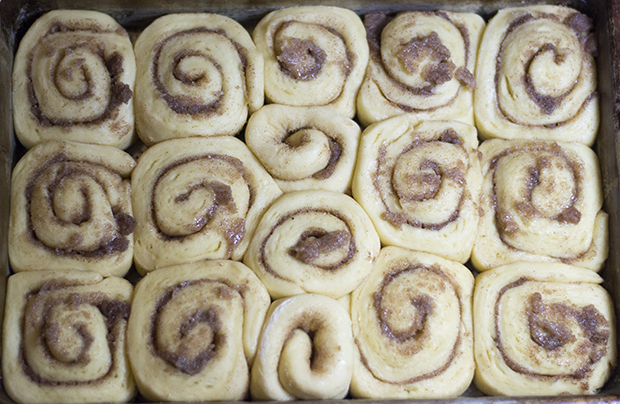 Just make up the dough using the gooey cinnamon roll recipe, do the first rise, then make the cinnamon rolls, cover, and place them in the refrigerator. 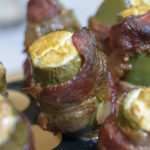 The next day, take the rolls out and let them rise for about 2 hours, or until they are doubled in size. Next, bake them as you normally would. It’s that simple. 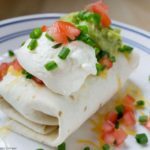 You could also make the dough and refrigerate it right away. The next day you can take the dough out and begin the rising stage. A pan of rising cinnamon rolls. 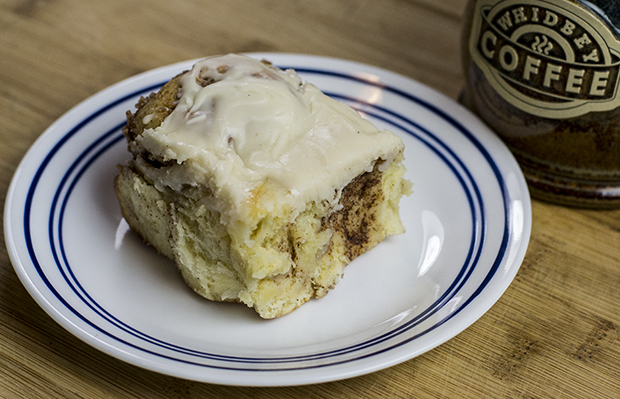 The icing on the gooey cinnamon roll recipe is super easy to make. Cinnamon roll icing is pretty simple to make from scratch. In its simplest form, it is just powdered sugar and water. Mom used to make icing this way and I never liked it. It was boring and didn’t taste all that great. 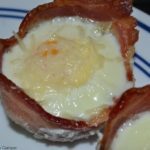 Mom was an excellent cook, but there were a few things that were not my favorites. This and jello molds top my disgust list. There are ways to make it a little more exciting. Adding a little butter, milk (instead of water), and vanilla really help a lot. Also, try to keep the icing fairly thick. Start with a small amount of liquid and add more as needed to get the right texture. 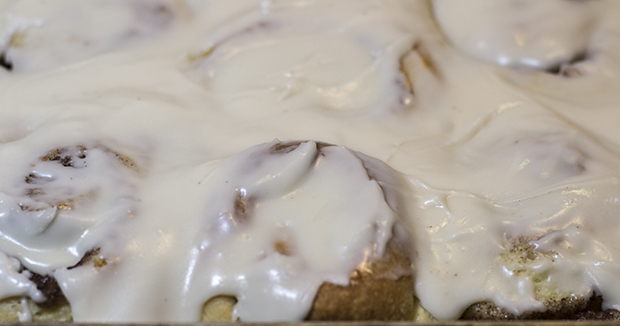 Cinnamon rolls topped with gooey icing for the perfect gooey cinnamon roll. Some people like to let the rolls rest for a few minutes before applying the glaze. Others spread it right after it comes out of the oven so that the glaze oozes into all the nooks and crannies. You can choose when you want to add the icing but it should be done when the rolls are still warm to maximise the gooeyness. Mom used to take frozen bread dough, let it rise, then punch it down and form it into cinnamon rolls. While this made them easy and they still tasted pretty good, they just were not as sweet as when they are made with the sweet dough. My original recipe made the cinnamon rolls this way, however, this recipe is much better. 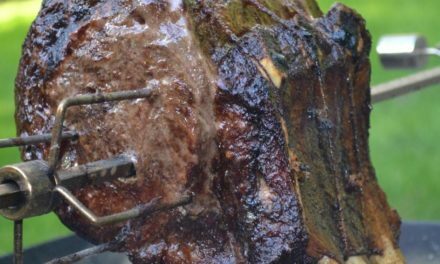 This recipe also makes a great version of Parker House Rolls. They both use the exact same dough recipe. Risen cinnamon rolls ready to bake. I haven’t tried this so if you have, please let me know what you did. I love crescent rolls and would be interested to see how well this works. Same goes for this method. 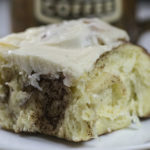 I doubt either method is as gooey and fresh as my gooey cinnamon roll recipe, but if you are in a hurry, this might be a good way to go. Again, if you have tried this, please let me know in the comments how it went. One heavenly bite of one delicious cinnamon roll. Well hell, I doubt you will have any of these gooey cinnamon rolls left over, but if you do you can store like bread. That means an airtight container with as much air removed as possible. 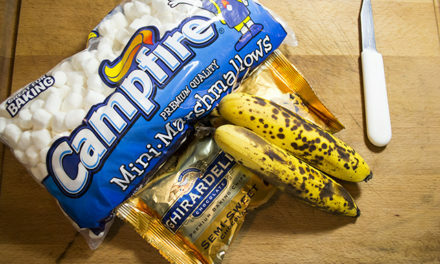 I have left these out on the counter overnight before and while they were not as good, they were still edible. They will keep much better in a ziplock bag, unstacked. Make sure they are completely cooled or the frosting will stick to everything but the cinnamon roll. 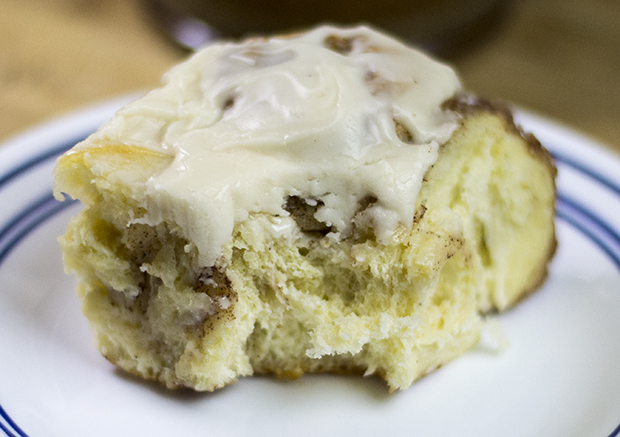 Common, this is a gooey cinnamon roll recipe so stay with me here. If I keep them until the next day, nuke them to soften them up. Because, damn it, cold cinnamon rolls are not good. 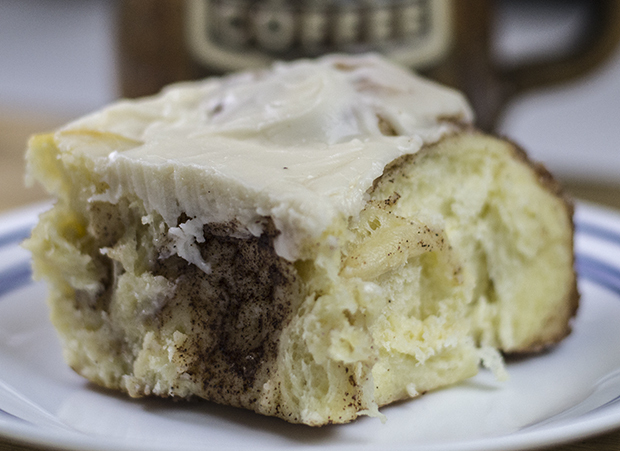 Delicious cinnamon roll served with quality local coffee. 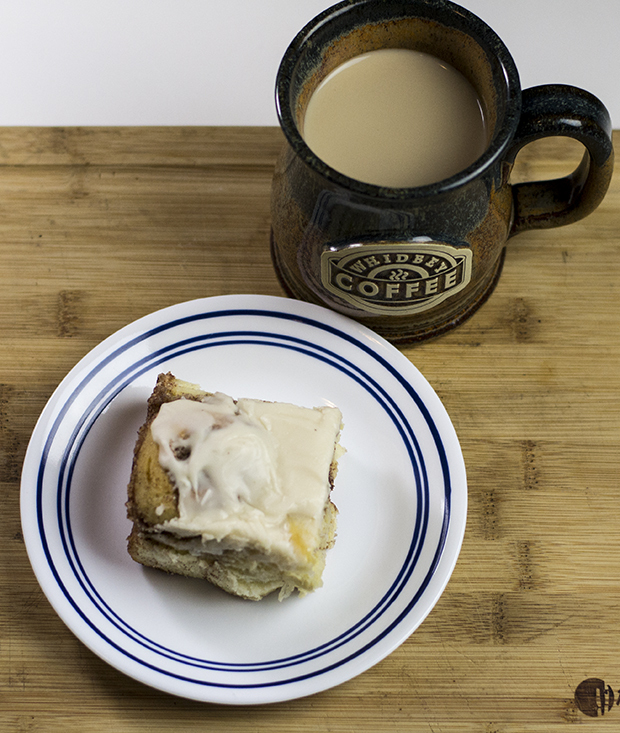 This gooey cinnamon roll recipe is a tried and true sweet roll recipe. This is a variation of the sweet roll recipe from Professional Cooking. The recipe in the book makes a huge amount, more than would fit in my standard classic, Kitchen Aid mixer. So I modified the recipe, changed it from weight measurements to volume measurements, and then changed it to use half and half instead of milk because I never have milk around, but I always have some half and half. It works pretty well. You can also use milk. I have also made these using salted butter, but unsalted is preferred because it is best for baking. Coffee goes great with cinnamon rolls. Deliciously gooey cinnamon rolls make a great treat any time of year. Place the milk in a saucepan with a thick bottom. While stirring continuously, bring the milk to a boil and immediately remove from heat. Let cool down to 110° F.
Dissolve yeast in the milk. In a stand mixer with dough paddle, mix butter, sugar, and salt until smooth. Beat in eggs at medium-low speed. Add liquid, then flour. With dough arm, mix another 4 minutes at medium-low speed. Place dough in a bowl and let rise at about 80°F for about an hour and a half or until double in size. Punch dough to remove air and place on floured surface. Roll out the dough with a rolling pin to about 1/4 inch thick. Melt the butter and place at least half on the flattened dough. Mix sugar remaining cinnamon and spread liberally over buttered dough. Pour remaining butter over as evenly as possible. 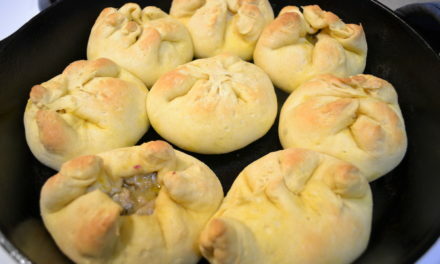 Roll the dough tightly by starting from the far side and rolling it towards you. 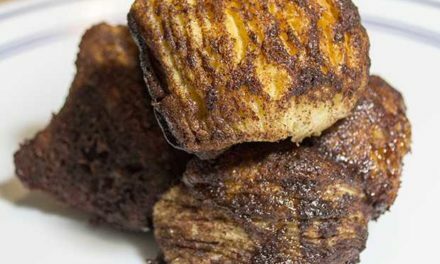 You will likely lose some of the butter, sugar, and cinnamon mixture. Cut the roll by starting in the middle. Then cut the two sides in the middle. Continue cutting until you have about 1 to 2-inch pieces. Let rise another 1 to 2 hours or until doubled in volume. Preheat oven to 375° F. Place rolls in the oven for 20 minutes, or until golden brown. While cinnamon rolls are baking, combine the confectioner's sugar, butter, milk, and vanilla until well combined. Add milk slowly, use more or less to get a frosting like consistency.